Windows 10 Pro is the latest release of Microsoft operating system which has outpaced all other releases of OS in adoption rate. It features a new model of updating. Windows 10 Pro gets updated continuously on the go unlike previous version which have been updated once a year. Windows 10 Pro inherits design from Windows 7. This design will be much estimated by those users who have been scared up by the tile design presented in the 8th release of Windows. The 10th version features conventional Start menu and features which are familiar to users having used to older versions of Windows. The system is created to unify the work for pro users frequently switching between desktop and mobile gadgets presenting the ultimate level of compatibility and integration. Windows 10 Pro features new capabilities as Cortana assistant designed to speed up your work, accelerated start up speed, touch screens capabilities, virtual desktops to simply organize your working space, advanced notification system, lightweight Office applications and a new browser. 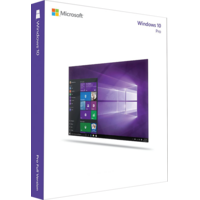 If you want upgrade to Windows 10 Pro you will need to have Windows 7 or 8 in Pro edition. Otherwise you need to buy Windows 10 Pro. Unlike Windows 8 tile design, the interface of the 10th edition looks simpler and clearer. It is a 2D design showing all the features and available at the moment options for completing a task on the surface. The old fashioned Start menu is back in the 10th edition but is is amplified with all new features and architecture. Still it inherits some tile design of the 8th version. But the tile part of the Start menu is customizable. You can easily change its size and proportion according your preferences. The tile part will include the most frequently used options and applications. Moreover the tiles can contain live information you need to get in a glance as weather, incoming emails and tasks, news, messages from selected apps. Tiles are still of great use for those using Windows from touch devices making them more accessible. Moreover you can customize the tile layout using 4 tiles in the area instead of preset three ones. Windows 10 Pro is a great update considering the needs and the mode of interaction of modern users and advanced devices.